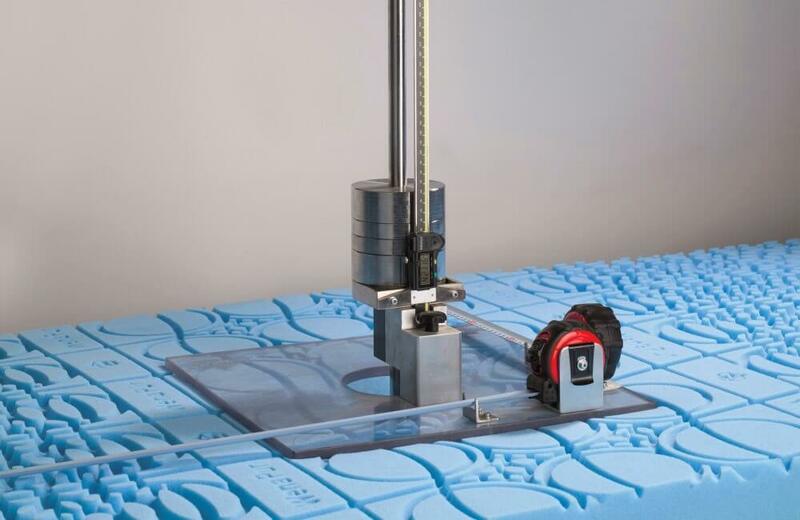 The materials and workmanship of the Wenatex products are tested at regular intervals by renowned, independent institutes. 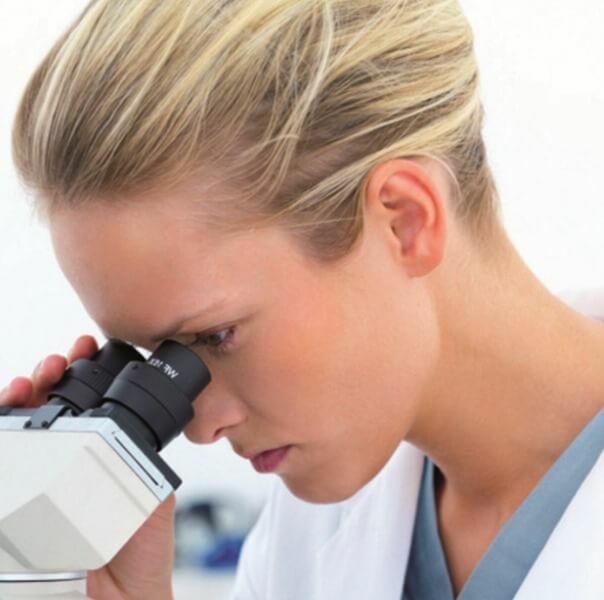 During the course of these external quality tests, all of the products are subject to stringent and heavy-duty endurance tests and analyses. 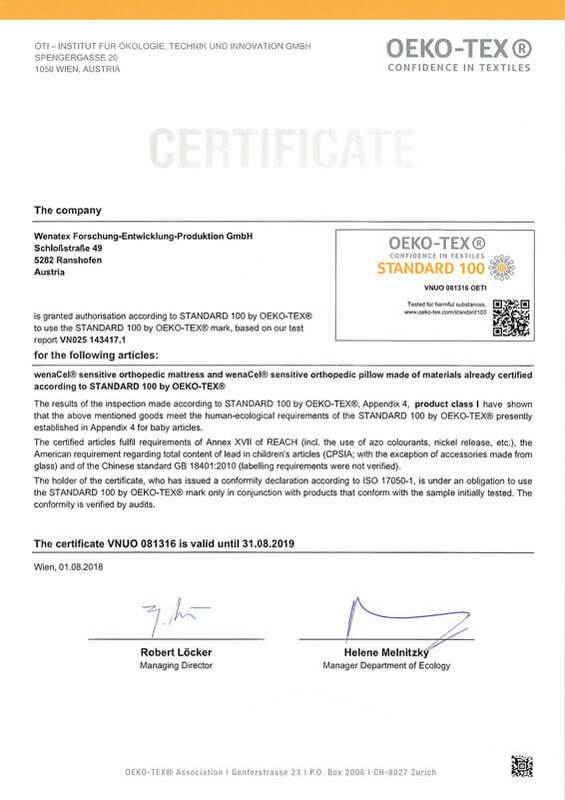 A variety of certificates awarded by external quality specialists guarantees the transparency of Wenatex quality through the provision of comprehensible evidence. 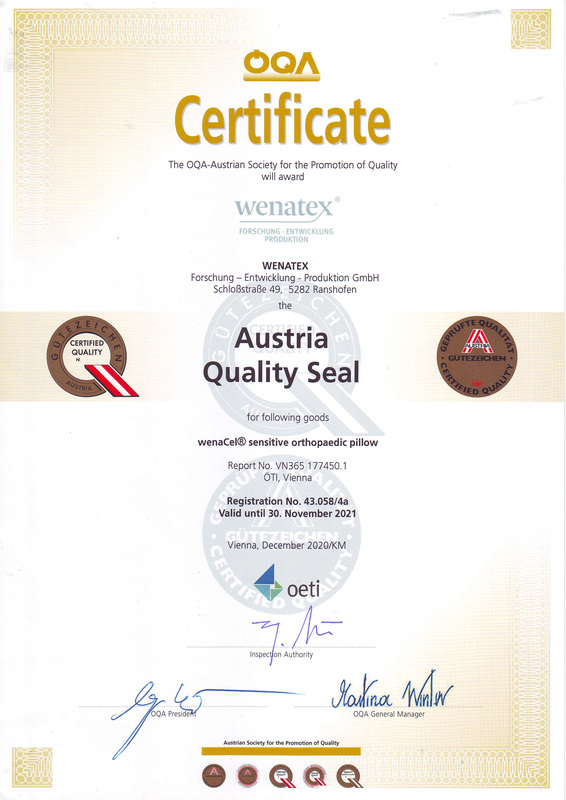 Customers can be sure: only top-quality materials are used for Wenatex products – because top-quality is standard for the renowned Austrian company. 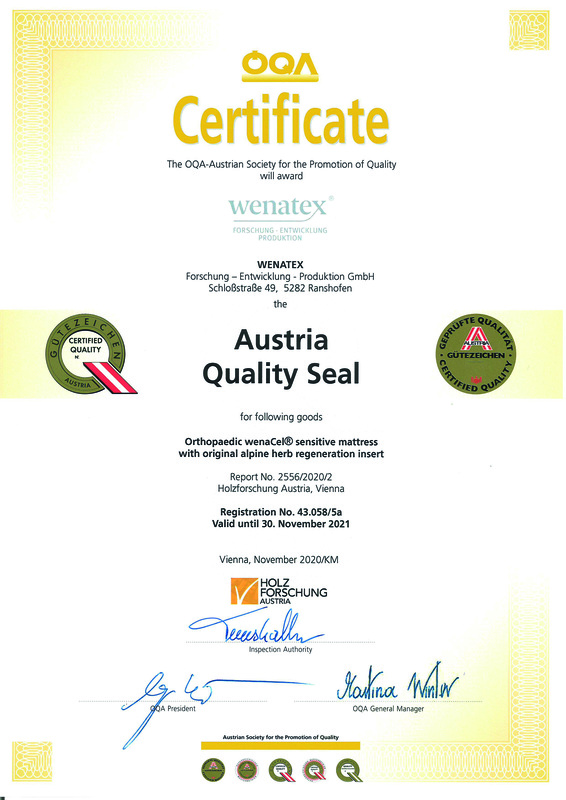 The Austria Seal of Quality awarded by the ÖQA certifies the excellent quality of products made in Austria. A sure sign of high class workmanship. 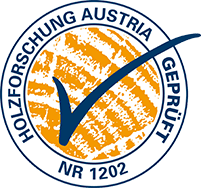 The HFA test mark awarded by Holzforschung Austria stands for the certified quality of the products and regular inspection of the production processes, which consequently forms the basis of the Austria Gütezeichen – Seal of Quality. 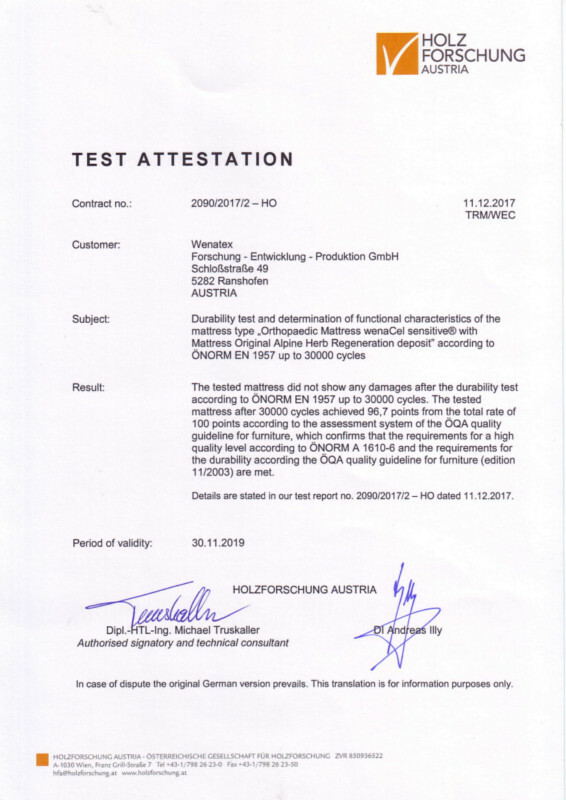 The HFA test mark is a certification that Holzforschung Austria carries out regular inspections to ensure that the wenaCel® sensitive orthopaedic mattress and the wenatex® alpine herb regeneration insert completely fulfil the stringent quality standards. 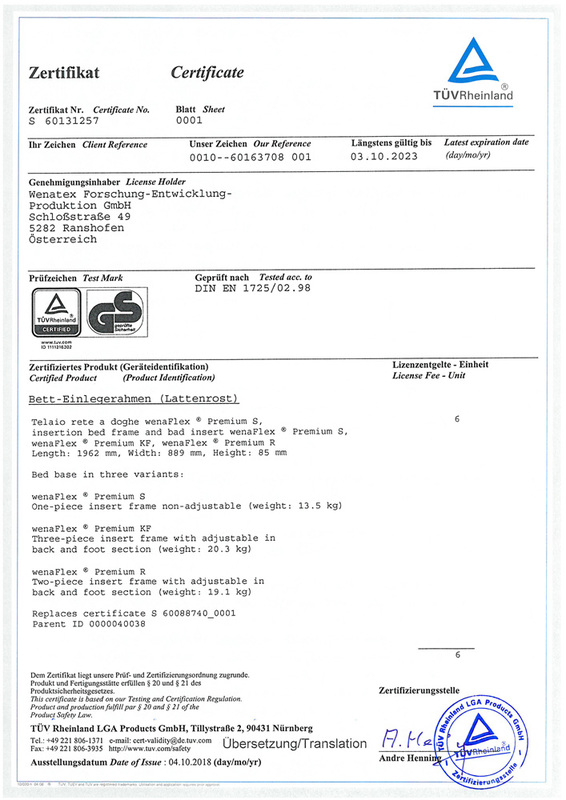 TÜV Rheinland LGA Products GmbH (Technical Control Board Rhineland) tests Wenatex products with regard to quality, durability, harmful substances, emissions, ergonomics and safety. 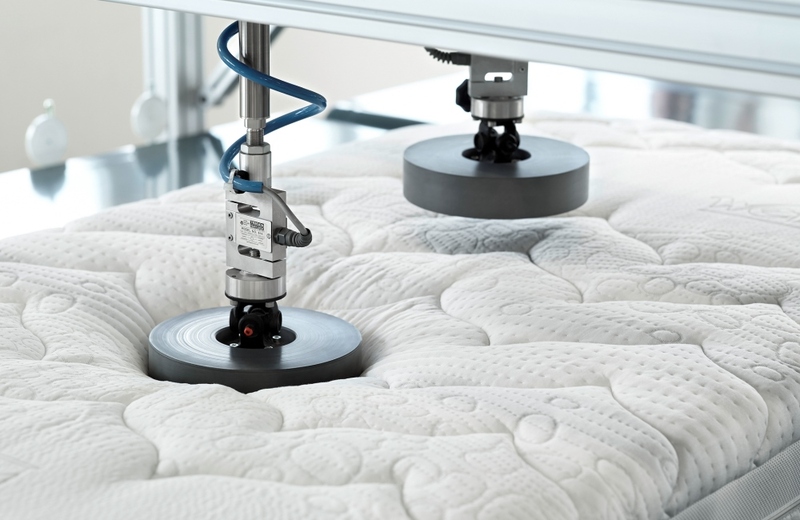 In addition, the Ergonomie Institut München (Munich Institute of Ergonomics) tests the ergonomic functions of our mattress in combination with the wenaFlex® Premium bed base with regard to “pressure relief” and “body support”. 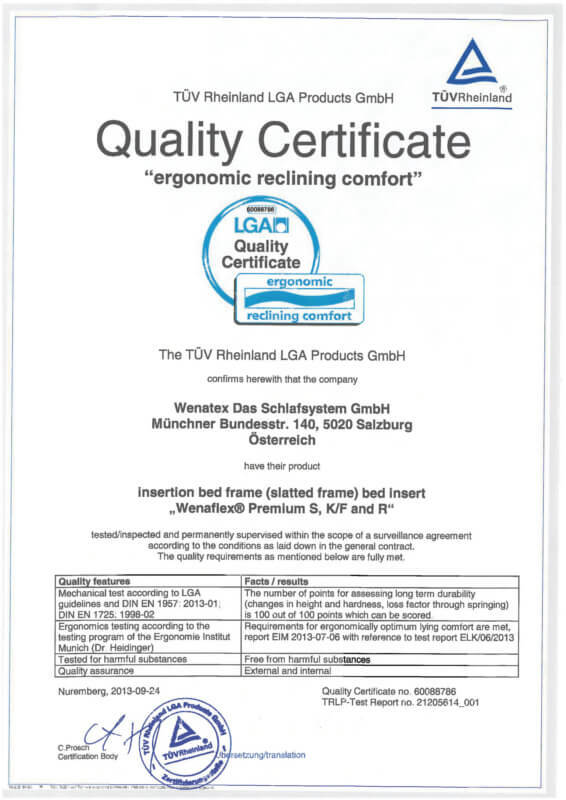 TÜV Rheinland LGA Products GmbH awarded both Wenatex products the coveted certificate for “Ergonomic Lying Comfort”. 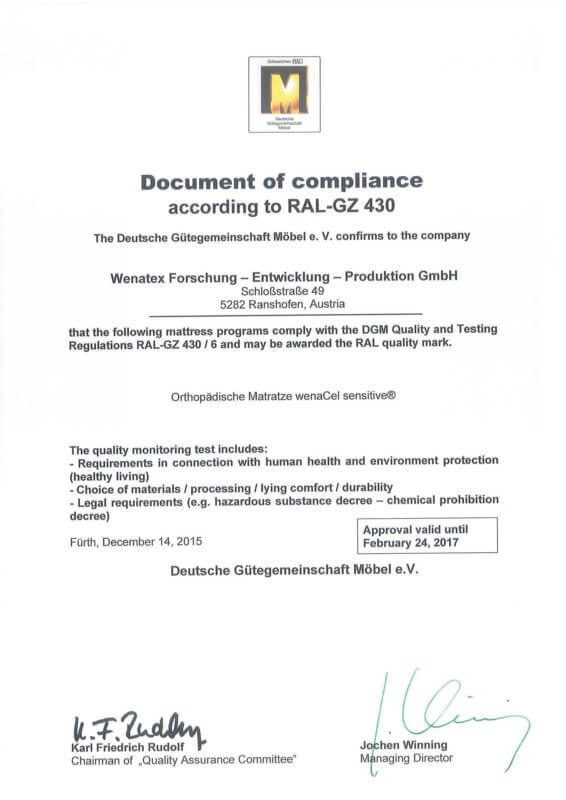 The “Golden M” is the RAL Seal of Approval awarded by the Deutsche Gütegemeinschaft Möbel e.V. 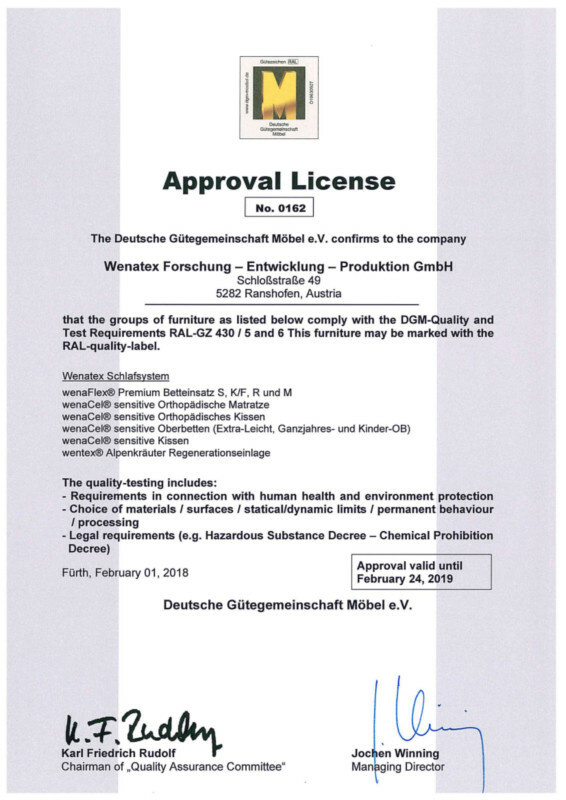 – German Quality Assurance Association for Furniture – is renowned since more than 50 years as a reliable reference for the highest quality and health compatibility and it is the only Seal of Approval for furniture that monitors and certifies the entire quality through neutrally performed tests. 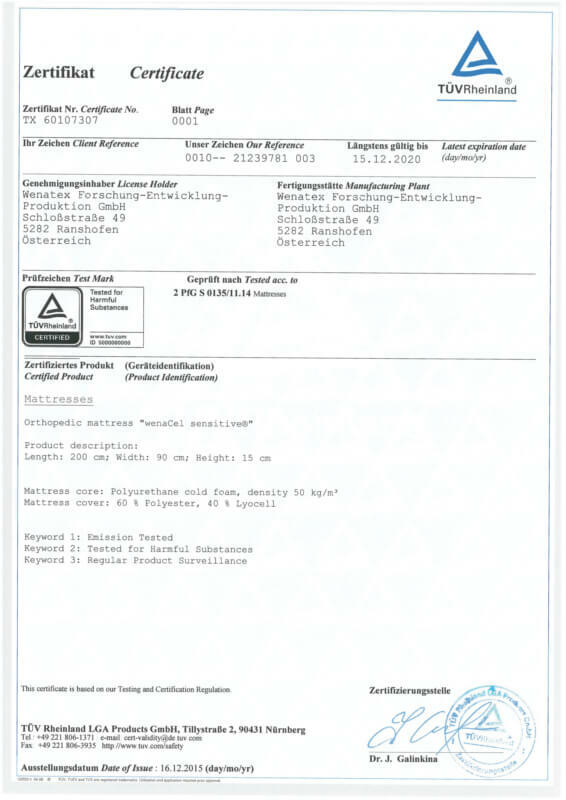 Thus, the “Golden M” offers consumers not only security in terms of a long service life and perfect functioning of the respective product, but also with regard to requirements put in place for the protection of health and the environment. 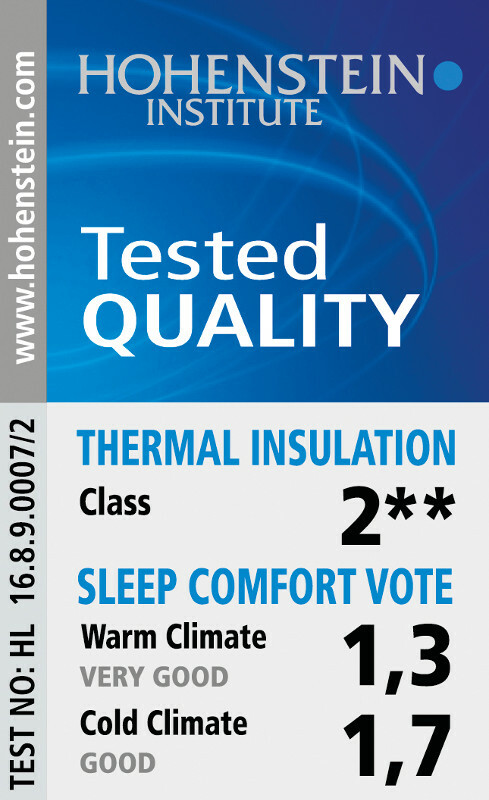 Thanks to the scientifically sound and practically relevant requirements, the Quality Label awarded by the German-based Hohenstein Institute is a highly trusted distinction. 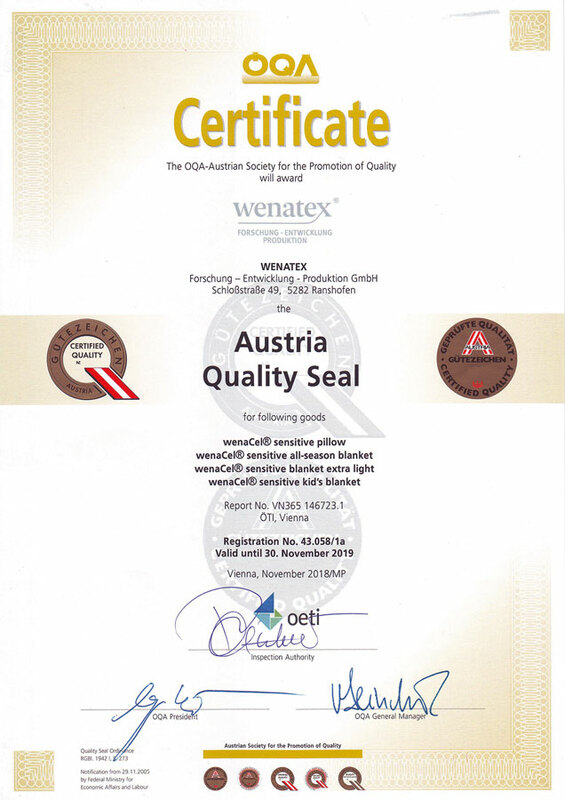 Subsequent to tests carried out by the Hohenstein Institute with bacteria strains and mould fungi, Wenatex products were awarded the “antimicrobial / skin flora neutral” Seal of Quality. 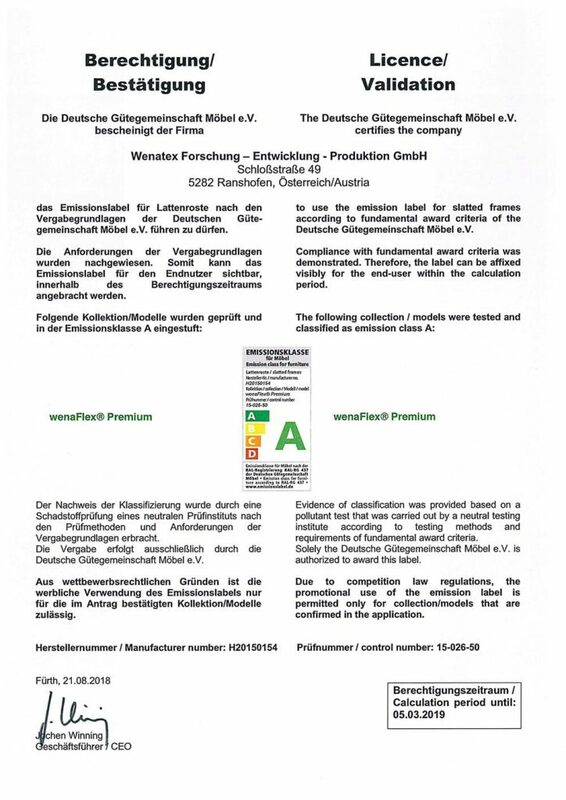 Furthermore, the wenaCel® sensitive all-season duvet, the wenaCel® sensitive extra light duvet and the wenaCel® sensitive child’s duvet were evaluated for their quality of the sleeping comfort and rated as extremely positive. 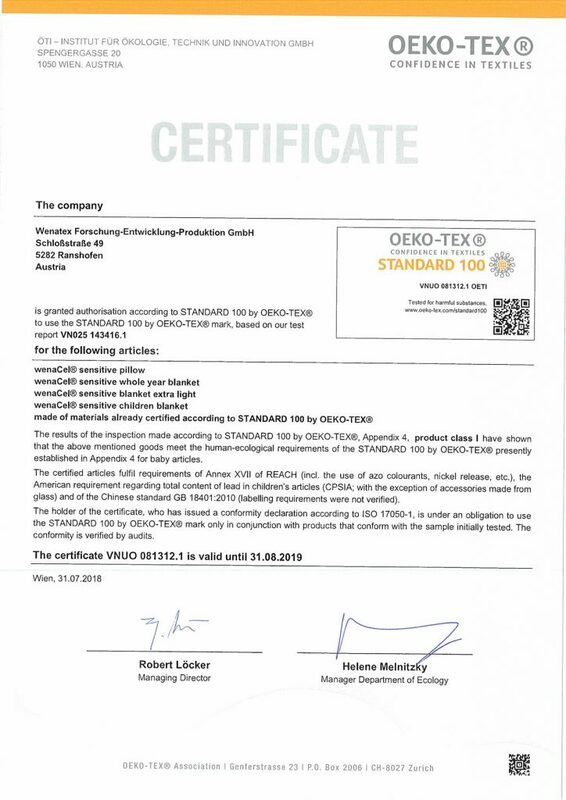 The OEKO-TEX® Standard 100 is an international testing and certification system for textile raw, intermediate and end products. 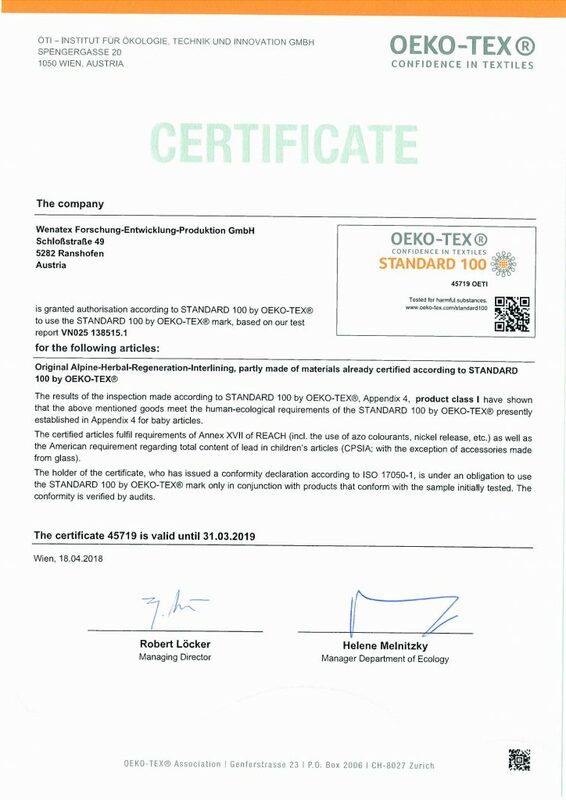 All kinds of textile products, which are absolutely harmless to health, are awarded the Oeko-Tex® Label to give the consumer the guaranteed secureness that the respective textile product is in fact a skin-friendly product. 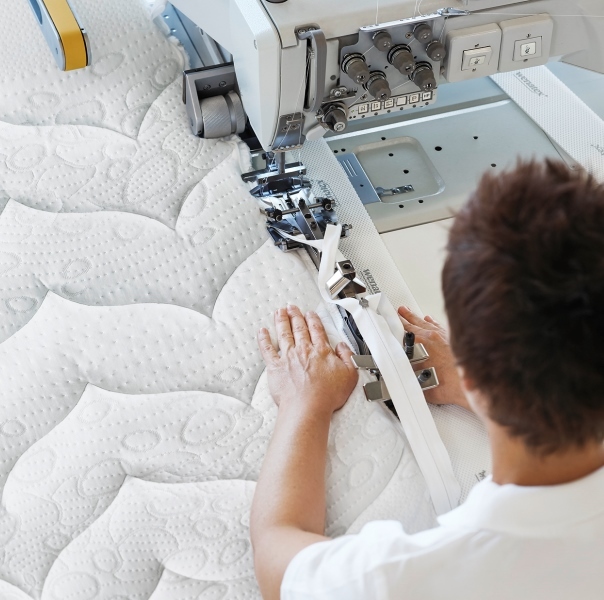 The more intensive the level of skin contact with a textile product (and the more sensitive the skin), the higher are the human-ecological requirements that have to be fulfilled. 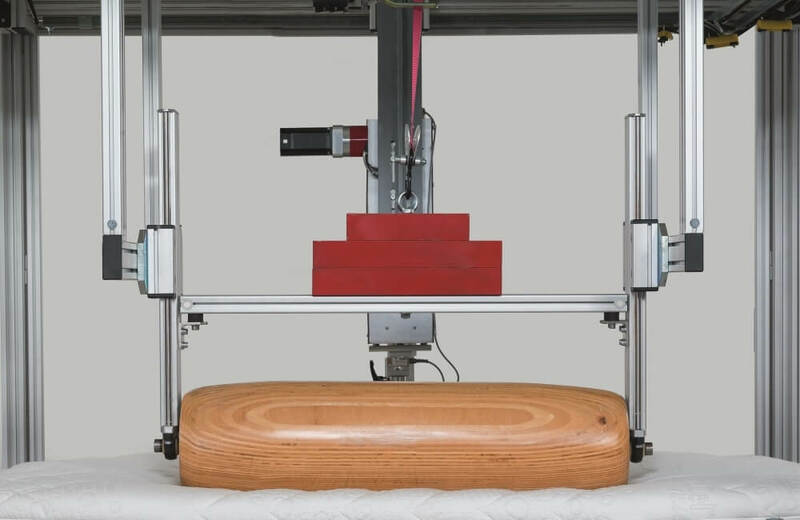 The products are divided into two product classes. 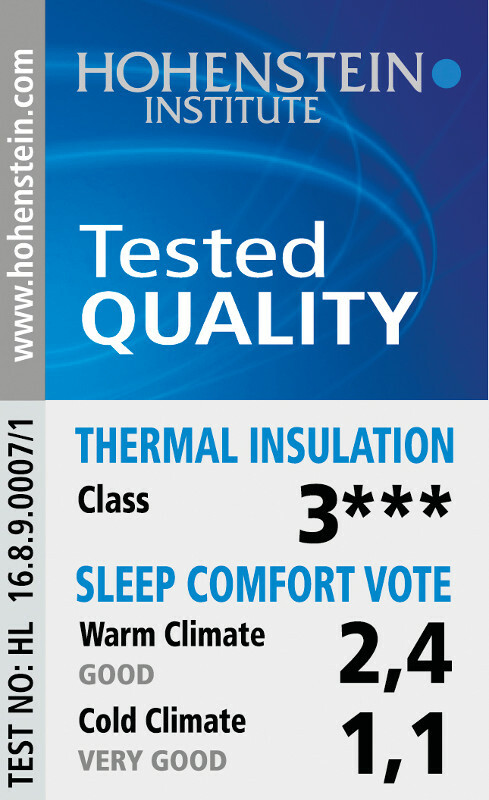 The Wenatex mattress is categorised under the highest product class (i.e. ideally suitable for babies and small children). The institute has also awarded Wenatex further certificates for the Alpine herb regeneration insert, pillow and duvet. 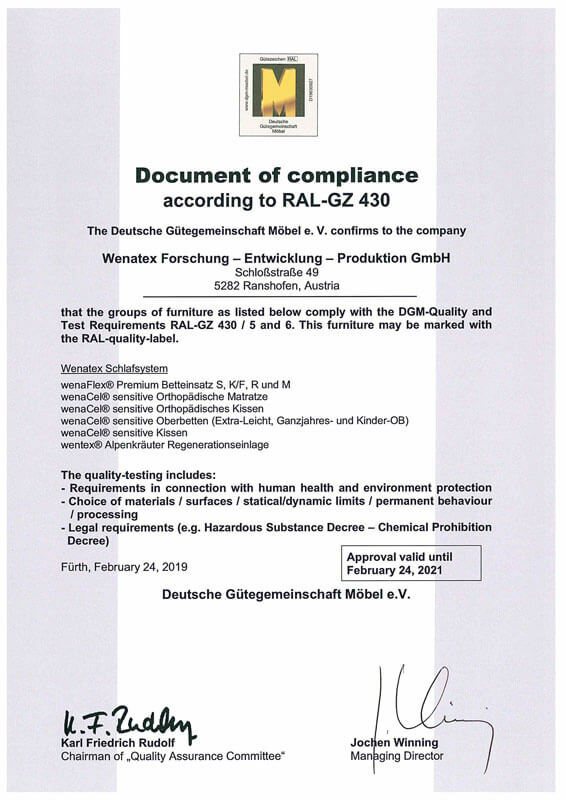 “Confidence in textiles” is an international synonym for responsible textile production – from the raw material to the finished product on the shop shelves. 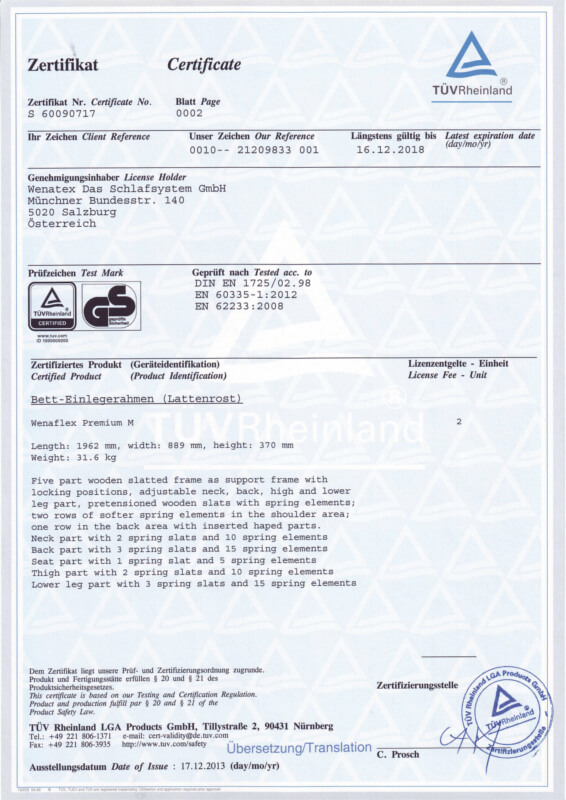 Own production to guarantee top quality.